It is essential, says Krishnamurti, to understand ourselves, how we think, what we think, why we think that way, the nature of our conditioning. "To follow oneself, to see how one's thought operates, one has to be extraordinarily alert, so that as one begins to be more and more alert to the intricacies of one's own thinking and responses and feelings, one begins to have a greater awareness, not only of oneself but of another with whom one is in relationship." Everywhere Krishnamurti insists that we must get to know the processes of the mind. Ramana Maharshi flatly denies that there is a mind to get to know. In investigation "it will be found that the mind does not exist." "There is nothing but the Self. To inhere in the Self is the thing. Never mind the mind. If its source is sought, it will vanish." Harding says you could label the first type spiritual-psychological and the second spiritual-religious and admits that he lands in the spiritual-religious camp. He also expresses his conviction that "to follow a spiritual path to its conclusion, you have to be careful not to be diverted along other paths." What does the seeker of truth need to do  roll the dice to determine which of the two camps to join? An open-ended commitment to either path means a possibly life-long commitment with no guaranteed results. If you pursue it for years or decades without ultimate realization and then quit it for the other camp, you may have been one day away from success and may have slid some or all the way back toward where you started. Or should the seeker attempt to walk both paths simultaneously? Either way's a crapshoot. So what's the best way to proceed? sink within and seek" points the way, but it doesn't offer much guidance. As more directive examples of teachings that represent the two camps, let's consider the paths outlined by Douglas Harding and by Richard Rose. I met Richard Rose in 1978 after a decade of growing frustration at not being able to find the missing purpose or meaning in my life. I have written about that in more detail and will skip to the bottom line: he inspired me to the roots by pointing out that all answers lie within. His "Threefold Path" article outlines the spiritual path that he recommended and that I attempted to implement over a period of 25 years. If there is a greater Reality than the Mind-dimension, then those who are in search of it cannot ignore the need to thoroughly understand the Mind, from the somatic mind to the most intricate functionings of the higher mind in its direct-mind experiences. More specifically, Rose described the structure of the mind that we retraverse in the search for our source as a "Jacob's Ladder" and felt that we get pushed up the ladder by those we reach down to help more so than we climb it by our own efforts. Sometime before the end of the 25 years I had climbed or been pushed most of the way up Jacob's Ladder, paring away my self-definition to that of being an individual observer with no qualities or qualifiers other than that of coming and going with consciousness. And I was seemingly stuck there, not being able to go beyond that limitation. Then in 2003 I met Douglas Harding. Douglas was strongly convinced that the best route to self-discovery was a relentless practice of looking back at what we're looking out from, which he referred to as practicing headlessness. I knew from my years of introspecting the mind what he meant by that and had also done some of his experiments, which he had developed over the years to assist people in getting those glimpses. On the last day of my first visit with him, he assembled a few friends and put on a mini-workshop. When he did his "tube" experiment with me, it established a new and contradictory paradigm through which I could view the world and myself. Whereas I had been viewing the world  i.e., everything other than myself  as outside and my undefined self as inside, in the Harding model it was apparent that everything was inside me. 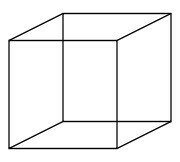 As with the optical illusion of the Necker cube that flips in and out as you stare at it, after doing the tube experiment with Douglas my mind was able to flip back and forth between the two contradictory paradigms of "everything is outside me" and "everything is inside me"  without being able to conclude that one was more valid than the other. That led to my personal demise six months later. Two Paths or Two Paradigms? There's something that we need to see or hear or feel (I'm attempting to use a sense analogy for the more abstract "intuit") to awaken us to the possibility of finding the permanent satisfaction of our heart's desire and to get the ball rolling in that direction  in other words, starting us on an intentional path of action. For me, it was this troika: all the answers are within; nothing can be known until the knower is known; and the self is never that which is known. Hui-neng tells us for him it was hearing a wandering monk reciting the Diamond Sutra. That catalyst will propel us to look for a permanent state of wholeness by going within. No paradigm or way of looking at the self and world is going to take us beyond the self-other duality to our unitary state of being. We take that paradigm we're working in as far as it can go. This can't be done by agreement or mere intellectual comprehension. We have to see (feel, hear, intuit) for ourself, becoming our own authority rather than taking someone else's word as the authority. What will then take us the next step? An opposing paradigm, which appears equally valid. Every paradigm has an equal and contradictory opposite. For example, are your feet up or down? The worldview most if not all of us are conditioned into tells us that if we're standing or sitting, we're up  i.e., we're in our head (a meatball parked atop our torso) and our feet are below us, or down. But if we go with our first-person view rather than the interpretation we've been taught to parrot, we may "see" that our feet are up from the headless point of view. Every pair of equal and opposite paradigms can be transcended. When the opposition is big enough, transcending it will take you beyond all paradigms to Recognition of what you really are. I think you can probably see what I'm leading up to, which is that Harding's teaching and Rose's teaching, while seemingly incompatible and contradictory, can provide an opposition that will propel you beyond oppositions. The important thing is to develop a system of work and persist with it, letting intuition guide you. For intuition to do that effectively, you need to cultivate clarity of mind, which is an integral part of your system of work. Spiritual progress occurs by dispelling illusory beliefs and is thus a subtractive business. The end result of spiritual investigation is knowing what we are at the core of our being. This knowing is not a type of knowing we're familiar with since it goes beyond the knower-known split. We recognize our essential nature by becoming one with it. The drop of rain loses its boundaries, its individuality, when it hits the ocean. That was Rose's ideal for a group of people working together on the grand project of knowing the self, which became the basis for the TAT Foundation that he formed in 1973. Stand in a circle with some friends  between say 3 and 10 of you. Put your arms round each other so that you are close, and look down. There you see a circle of bodies. Obviously they are distinct from one another, each taking their own space. They do not merge into some kind of 'oneness'. Each body there has a name, a background and history, an age, a nationality and so on. Down there we are separate from one another. Notice your own body  it disappears above the chest into No-thingness. Notice that from this point of view the other bodies also disappear above their chests  into the same No-thingness that your body disappears into. Here at the top there are not many No-things  just one. Here in this edgeless space are no dividing lines, no name tags, no bit of the No-thing that is mine or yours. Here we are indivisibly one. The nameless awareness here at the top includes all those different bodies. They all disappear into, or emerge out of, this One who has no name. Looking down, each of us has our own unique point of view, our own thoughts and feelings. I don't know what you are thinking, or what your past is. I might not even know your name. But I can see who you really are  here at the top of the circle. Here at the top all our differences dissolve, all separation is overcome  without destroying those differences down there. The space at the top has room for every point of view. The No-Head Circle is like a circular temple. The bodies form the walls, like columns. But this temple is ruined  the roof has been blown clear off. The temple lies wide-open to the sky  a sky that is totally clear. A sky that is boundless. You are that infinite sky  the sky of Being. Who is it that now looks down? Looking at the Looker I come home to who I really am, the One who has no boundaries, and I find that this One includes everyone. Down there in the circle I am one amongst many  others stand either side of me, apart from me, with me, perhaps even against me. But here, above the line of chests, there are no others. All divisions are healed, all separation overcome. Here, looking down, including us all, is the One within all beings. You are that One. Please note that reading about this experiment doesn't do the trick. Try it, and see if it causes a shift in your paradigm. The same caveat applies to all spiritual reading. To be helpful it must inspire action, which ultimately means looking for yourself.